For a lot of people, "Marvel is doing a new Exiles series with Saladin Ahmed and Javier Rodríguez" is enough to open up wallets all by itself. If you understand how great all three of these names are and are just looking for a thumbs-up confirming that combining them works as well as it should, your thumbs-up is given. The new Exiles is superb. 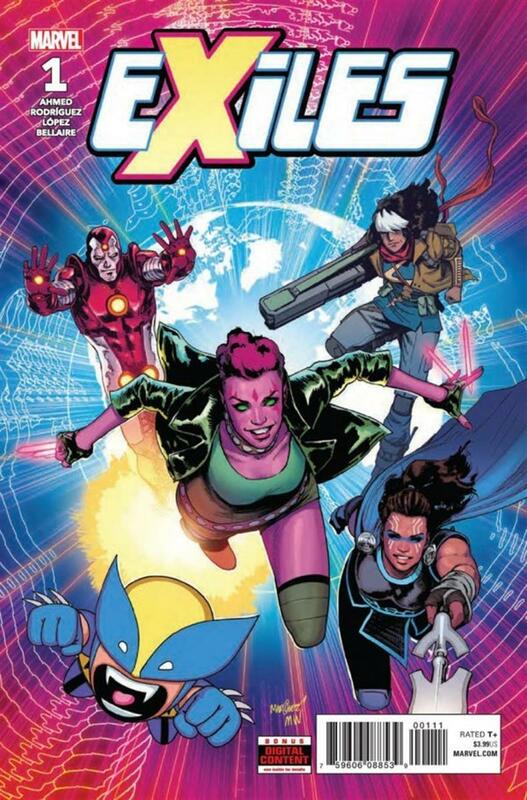 If you're unclear on how awesome "Exiles," "Saladin Ahmed," and "Javier Rodríguez" all are, I'm here to help. And I'll hold off on the spoilery stuff till the end. Exiles! It's a big scary multiverse out there, and it needs a mutant team dedicated to righting wrongs in alternate realities. The stakes are always high, the characters are challenged to their utmost, and a certain amount of failure and loss is inevitable. At its best, the concept lets creators explore insanely great new takes on Marvel history and do heartbreaking character work. At its lamest, the Exiles can devolve into a "greatest hits" tour through existing AUs - but it doesn't seem likely that these creators are going to be taking us to lame-town. Saladin Ahmed is a superb writer who penned a good sci-fi novel and then debuted in Marvel comics with last year's Black Bolt. That book was also insanely great. Mr. Ahmed's scripts taught us plenty about Black Bolt, gave him a wonderful new supporting cast, and against all odds, made Crusher Creel the Heartbreak Kid of 2017. Saladin Ahmed can write. Also, his words fully lived up to awesome visuals of Christian Ward, which is quite the accomplishment for any comics scripter. What sort of Faustian pact did Mr. Ahmed cut with the Dark Editorial Gods to ensure that his Marvel career is launched with some of best artistic partnerships in the business? And that brings us to Javier Rodríguez. An excellent Marvel all-arounder with a distinctive animation-esque style, Mr. Rodríguez recently demonstrated his "crazy dimension-hopping" chops (and his taste for wildly imaginative layouts) in the visually-brilliant Doctor Strange and the Sorcerers Supreme. You could not pick a better artist to do an alternate-universe-surfing Marvel book in 2018. Here he's paired with inker Álvaro López and colorist Jordie Bellaire to work a little magic. This art team capably accomplishes something that earlier incarnations of Exiles sometimes struggled with: making different AUs look truly different. This issue takes us to a post-apocalyptic realm that's beautifully redolent of the Dark Knight Returns and a flying-car future that screams "Moebius." Plus a single-page peek at a lush Bahamas streetscape and some brilliantly moody Moon ruins. Their character work is also superb; Blink's new Bahamian look is a very welcome upgrade. And Javier Rodríguez summons all of his layout talents to make involuntary timeline-hopping look properly dramatic. Mr. Ahmed kicks this new volume off with a classic "call to adventure" hauling Clarice "Blink" Ferguson out of a brief but happy retirement. She's rapidly reunited with the Tallus armband, a mysterious bit of dimension-hopping gear that's now operating with its own agenda. A pair of quick timeline jumps introduces her to the first two members of a new team and a doozy of a first antagonist. Even with two team members yet to be introduced, this #1 offers up more than enough fascinating mysteries to chew on. And this is really only "slow" in terms of assembling the team; the actual pace of events is almost breathless. We still have a lot to learn about the team members we have met. And there are already enough fascinating hints salted through the story to reward a closer re-read. This shows every sign of developing into a dense, fascinating tale. Maximum Spoilerage! Let's talk characters! The Unseen: Mr. Ahmed sketches a compelling picture of the Watcher-Who-Was-Nick-Fury. The Unseen is pulling classic Uatu duty, "not" interfering in a very interfere-y way. Plus, the Unseen meets AU Nick Fury, yes! Classic Nick Fury is salty about the girly robe he's wearing these days, of course. Kamala "I Will Shoot You If You Call Me Ms. Marvel" Khan: You can't draw a grizzled Marvel character with a giant leg-sized gun and not catch some Cable parallels, obviously. But this Khan actually draws from other wells. She's got a strong "Ripley from Aliens" vibe, and Khan and her home universe are visualized in a very "Dark Knight Returns" way. Álvaro López's inks help with this a great deal, and somehow Khan's distinctive Miller-esque tone sticks around and works even after she's plucked from her timeline. Impressive! Iron Lad: He's stuck with the most untapped potential. Some slightly clumsy writing together with an Editor's Note makes it clear this is an alternate (possibly cowardly?) Nate Richards who said, "nah, miss me with that noise" to the idea of travelling back in time and joining the Young Avengers. The pace of this book sweeps him off his feet and he's got no choice but to hero up - for now. Kang: In and out in a single page, drawn in a beautifully Kirby-tribute style and not allowed to take over the plot. That's how I like my Kang! The Time-Eater: The final splash page reveals a semi-surprising form for this antagonist. It might be slightly underwhelming at first glance, but I have every bit of confidence in the creators and I strongly suspect this Time-Eater is destined to go down a lot faster than you might expect. Who or what is driving the Tallus these days? That's our real antagonist, folks! Dang but I am going on at too much length. This is just a rich, tasty book that leaves you with tons to talk about after you've read it. Let's shut down the spoilers and wrap this up! "I'm a neon pink mutant and a girl, pal. I know something about being bullied." Lordy, that's good.